The book that took the parenting world by storm is now available as a DVD curriculum! Anyone who has dealt with parenting problems knows that it is no easy task to turn bad behavior around. Bestselling author and psychologist Dr. Kevin Leman is here to help parents, whether in a small group setting or at home, reverse negative behavior in their children--fast! With his signature wit and encouragement, Dr. Leman offers parents hope and practical, doable strategies for regaining control and becoming the parents they always wanted to be. In six sessions, he leads participants through the key concepts from the book--and keeps them laughing even as they learn how to change their family life for the better. Parents will be won over by Dr. Leman's keen insight into the family and will feel renewed in their commitment to raise great kids. 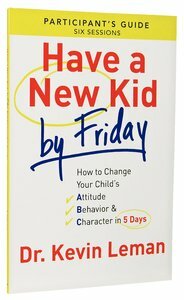 About "Have a New Kid By Friday: How to Change Your Child's Attitude, Behavior & Character in 5 Days (A Six-Session Study) (Participant's Guide)"
Dr. Kevin Leman, an internationally known psychologist, radio and television personality, and speaker, has taught and entertained audiences worldwide with his wit and commonsense psychology. The best-selling and award-winning author has made house calls for hundreds of radio and television programs, including The View with Barbara Walters, The Today Show, Oprah, CBS's The Early Show, Live with Regis Philbin, CNN's American Morning, and LIFE Today with James Robison, and he has served as a contributing family psychologist to Good Morning America. He is the founder and president of Couples of Promise, an organization designed and committed to helping couples remain happily married. Dr. Leman is also a charter faculty member of iQuestions.com. He has written over 50 best-selling books about marriage and family issues, including The Birth Order Book and Sheet Music: Uncovering the Secrets of Sexual Intimacy in Marriage. Dr. Leman was born in 1943 in Tucson, Arizona, and earned his degree in psychology from the University of Arizona. He and his wife, Sande, make their home in Tucson. They have been married since 1967, and have five adult children.